Today we’d like to introduce you to Dr. Nafiseh Hashemi. Dr. Hashemi graduated from Iran university of medical sciences in Tehran. After finishing an internship in general surgery and internal medicine, she completed a residency training in ophthalmology, an adventurous spirit and deep compassion for those in need inspired her dedication to preventing blindness and visual impairment in underserved areas of Iran for 5 years, while providing training for medical students and ophthalmology residents. Dr. Hashemi’s rigorous medical training continued after immigration to the united states including a surgical internship in the university of Tennessee, Ophthalmology residency in the university of Texas health in Houston and neuro-ophthalmology fellowship training by mentorship of world renowned neuro-ophthalmologist, Dr. Andrew Lee, in Houston Methodist hospital. She has been involved with research and publication in all these years and presented her works in national and international meetings. 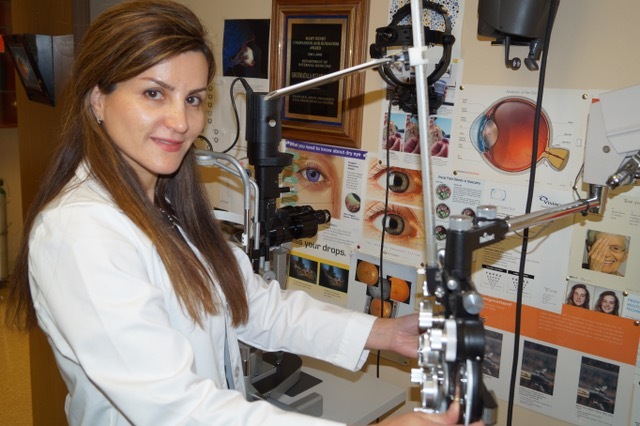 Her passion in treating and helping visually impaired patients comes along with her area of expertise in dealing with complex and challenging neuro-ophthalmology and glaucoma patients. Her advanced surgical skills made her able to serve her patients in all level of care. When I graduated from high school, I had to compete with one million applicants to get into public university. The odds for medical school in Tehran was almost 1000 position only. I got into it, that was a huge deal and my family were very proud. The next difficult step was getting into ophthalmology residency which is one of the most competitive and high demanding residency in every country. That time, I was married and soon after first year of very disciplined vigor training I was pregnant with my first child. Since the first day of residency the program director warned female residents about pregnancy and having baby during 4 years of residency, I was trying to hide it until my belly was too big to hide. The chairman of the ophthalmology department told me, how she is disappointed of me and I won’t be able to pass the board exam with having a baby. I was working and studying hard to prove myself that I can be a good mom and doctor at the same time. I did it, I passed the board exam with a very good result and the same place that I did my training asked me to stay as faculty and be in charge of residency training and medical students’ education. This was a smooth transition. I finished my residency and the next day I was faculty in the same place. During 5 years of my work history in that teaching hospital, besides treating of thousands of patients, I trained about 20 eye doctors. The hospital was located in a sub served area, not even safe for leaving. There was a cold war between different religious groups. I witnessed a bombing close to where we were living, there were always fear of kidnapping and so many more. During those 5 years, I helped enough poor people, did many eye surgeries for free, empowered many women in my cooperation with “gender equity and women’s right”. It was time for me to leave and take my 8 years old son and my 6 months old daughter to somewhere safer. As soon as I noticed that I have a girl, my urge for leaving that area was getting more every day. After the big immigration to the U.S, immediately I found myself with no job and since I was more eager to dive in the new language and culture, I volunteered to start the study and apply for residency to be able to get license in the U.S. My husband was the one that suffered even more to take care of kids, keep us happy for easier transition to the new everything. He selflessly let me to go first and get back on the track of my professional life. Even though I got a very good score in the ECFMG exam, since I was foreign grad, older than other applicants with a Persian accent, it seemed impossible to get into the ophthalmology residency. So, I believe I had one strength and that was the power and energies that I got through helping those people in need in the place that I worked for years. I was so happy to get into ophthalmology again that I didn’t pay attention to difficulties of another move from LA to Texas. My son just found friend in school in LA that we took him to a new school in Houston. After one year neuro-ophthalmology training, in Houston, I got to leave for internship in surgery to Knoxville, TN, where I was feeling like an alien. No family or friends and this time I was all alone by myself. Since the internship was only one year, I left my family behind in Houston and was fighting with depression because of being far from my toddler, son and my husband. I tried to fight the sad situation with setting some goals for myself to keep me running and inspired. I got a series of work out DVDs and aimed for getting 6 packs in few months. Also, I signed up for a medical test that I was studying for. That was my way of dealing with loneliness and preventing depression. Believe it or not, I passed the test, got the 6 packs and wrote some scientific papers and book chapter in ophthalmology. So, I got back to Houston and my family to start ophthalmology residency. Residency is hard for everybody, for me the hardship of residency was about knowing different system, culture and so many more things that I could not anticipate. I was so fortunate to know two amazing people who helped me through the way, Dr. Andrew Lee, and Dr. Judianne Kellaway. My mentor in fellowship and the program director who had the most influence and impact on my career and professional life. So, let’s switch gears a bit and go into the Advanced Eye Surgery Clinic story. Tell us more about the business. When I moved back to California, I registered my business as Nafiseh Hashemi, MD while joined an ophthalmologist to share the space. I started to get Persians to know me as the only Persian Neuro-ophthalmologist through Persian TV, radio and newspaper. After letting people know that I am available to take care of their eye, I set my goal to provide the most advanced care in ophthalmology. I knew, word of mouth is the best advertisement for a business. I had almost 12 years surgical experience and my patients who are happy with their eye surgery and special attention they get after surgery are the one who spread the word for me. I am easy to reach, they have my cellphone, and email. My patients become part of my family and I enjoy making connection with them. I learnt from my mentor Dr. Andrew Lee: “Doctor first, Ophthalmologist second”, I look at all of the health problem the patient has and try to help them through their problem with any tools of have. Help them get the care they need with the proper referrals, inspiring them to develop healthy habits, diet and exercise. In treatment of neuro-ophthalmology patients, I believe in taking the team approach and work closely with primary care physician, neurologist and neurosurgeons. The patient is always the center of the team, receives the information and makes decision about her/his own care. In one sentence, I believe the highlight of my practice is my bedside manner, professionalism and the hard work to provide the highest level of care for the patients. I have had many accomplishments to be proud of. I get a great deal of satisfaction every day treating my patients. I listen to the patients’ history, exam their eyes and put all pieces of puzzle together and find the answer, this specially happens a lot with neuro-ophthalmology patients. Most of them come to me with a mysterious disease and get back with an answer which sometimes can be lifesaving and this is the only sub-specialty in ophthalmology that deals with life.